My plan was to go to England to take an English course. The goal was to improve my English in writing, listening, speaking and reading. After this course I wanted to pass the IELTS-examination. 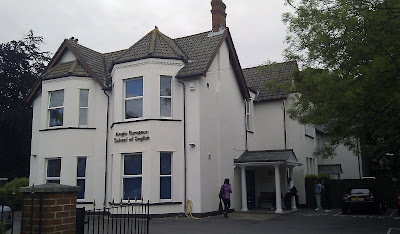 After some internet-research I found the Anglo European School of English (http://www.angloeuropean.org/) in Bournemouth. The school had good reviews so I signed up for four weeks for 15 hours/week general English lessons and 15 hours/week IELTS-examination training. On Sunday, May 1th my English adventure started. I drove by car to Calais, France. After a smooth crossing of the English Channel, I drove to Bournemouth. In eight hours I reached Bournemouth. Not any delays due to traffic jams during the journey. I chose to live in a home-stay during the course. It's more social and it gives a lot of opportunities to practise my speaking and listening. I stayed with Peter and Serena, a couple in their late fifties. There were very friendly, social, funloving and helped me a lot. With their help I did feel comfortable very soon. Serena cooked wonderful tasty dinners with excellent dessert, and prepared a lunchbox when I went away at the weekend. At the school there were between thirty and a hundred students. The last case was when a schoolbus from Austria and Slovakia arrived for just one week. Students were there from all over the world, for example: Saudi Arabia, Venuzuela, Spain, Germany, Italy and Korea. Their ages were between seventeen and twentyfour years old. Most people spend more than four weeks in Bournemouth, some people had already been there for eight months. On the first day you have to make an placement-test, so they can assign you to the right class (depending of on your grade of English). I spent four weeks in the advance class. In the morning I had my general English lessons. We did exercises to improve our grammar and increase our vocabulary. We discussed many topics, wrote essays and watched several movies, documentaries and You-Tube-videos. During the lunchbreak we ate together our sandwiches or hot lunch in the canteen and played pool, ping-pong or used the Internet. In the afternoon I had IELTS-examination training. They tell you how to prepare for the examination, the way they set questions, the do's and dont's and we did a lot of mock exams. It gives you an idea of what you can expect of the exam and what level you are now. The teachers were well-eduated, very friendly and helpful. My classmates in the advance class were very nice, unfortunately some students in the IELTS-classes were not so motivated. In the evening I spent most of my time doing my homework, watching TV, reading books and having conversations with my host family. Every week the school organised a movie. So I watched Four weddings and a funeral, The King's speech and The Expendables. I watched together the Football Championship Final Manchester United - Barcelona with my schoolmates and went for a laser game. My routine at the weekend was to do (alone or in the company of some fellow-students) a challenging hike in the hills and the coast around Bournemouth. 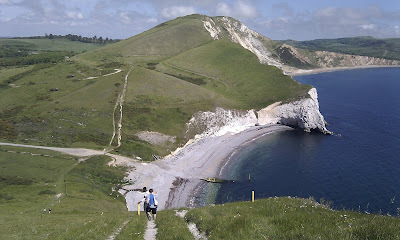 I did a scenic walk from Stubland to Corfe Castle (23 km), (on the military terrain) in the area of Tyneham to Lulworth Cove (very challenging hills with steeps of twenty degrees)(24 km) and one between Kingston and the coast. The other day I went to visit one of the famous (free!) London's museums such as the Imperial War Museum, Tate Modern, Natural History Museum and V(ictoria) & A(lbert) Museum. I did enjoy it very much! Everything comes to an end. On May, 28th I said goodbye to Peter, Serena and their son Olliver and went home. It was an impressive study journey. I can't say it was just a holiday, because of the busy schedule of the day, the homework and the increasing pressure of the approaching date of IELTS-examination in Amsterdam. However, I had a great time, met a lot of interesting people and did some great things. It was really a good experience and it was nice to be back in England. Sounds like a nice and educational month mate!